Tofu crusted with almonds look so good Harini. You have given great ideas for me and I would definitely try these out with paneer. Excellent recipe ! These tofu fingers look fantastic Harini . They are healthy , crunchy and delicious too . They would make such a great snack for bitings . hi harini.........first time at ur space! im completely blank when it comes to tofu coz its so bland.. will definitely give ur recipe a shot! Those almond crusted tofus looks fabulous, wish i get that plate rite now.. Seriously very tempting. Awesome recipe Harini, looks so sinful and I am sure kids enjoyed it so much!..I enjoyed reading all your posts this theme. Hopefully I will get some made myself. Tofu fingers looks so crunchy and delicious. Perfect to snack on with tea. All your tofu dishes are excellent. Wow, those tofu fingers look soooo crunchy and delicious Harini. That is such a healthy appetizer and/ or snack. 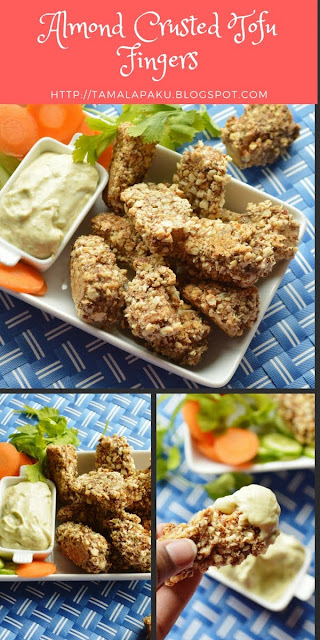 Harini, you are whipping up such delicious dishes with tofu and they are so quick and simple too!This almond crusted tofu looks so crunchy and so great to have as an evening snack with coffee / after school snack!